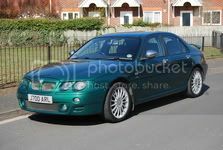 Forums » Technical Help for Rover 75 and MG ZT » 1.8 Litre K-Series Powertrain powered derivatives » Recon 1.8T engines worth it? Does anybody have experience of these and are they any good? I have seen one advert for a chap that rebuilds them in his shed and has a good website Roverkseries.com but is it just hype. I have bought a lovely car but the engine has been ruined and I didn't spot it. So I either scrap it or go the whole reconditioning route. I reckon that with all the faults the car will cost another £4000 to put right, which is eye watering for me and I know its not worth it but I was hoping to keep the car forever and just keep having it rebuilt. Pie in the sky? Delusional? Or worth trying. The interior is superb and I really like it as its a Tourer (I had one before and it was the best car I have ever owned. So what to do? Scrap or pay big money and keep? Cut your losses and look for a nice diesel or V6! No don't like diesels and the V6 seems to have its problems. Certainly cutting losses though so it get driven straight from the Autocentre tomorrow to the scrap yard. Shame, it is like new inside and out. Very unfortunately our cars are worth peanuts in financial terms these days, throwing any more than a few hundred quid at it is not very sensible IMHO. I have to agree with Mr Doodles. A well sorted V6 is the best option. (I also despise diesels) Don't shoot me I know some people love them, just a personal opinion. The V6 has always been the least problematic K series and, can be had for very little money for a top notch example. Or even one with a scruffy interior and swap out your current one. Best of luck with your search. I paid £900 for a lovely full history 190, 7 years ago, with a Cherished number worth £400, so I always call Ed (the Zed) my £500 banger. Since then, other than normal maintenance and a few upgrades (at my choice) he hasn't cost me a penny! So yes, I am a bit biased, but a 1.8T is a ticking time bomb (in my opinion) and it's not a matter of "if" but "when" it will blow it's turbo, or blow the head gasket and take the turbo at the same time! I may have been lucky, but there are still full history V6's out there, if you take the time to look for them and if you find a good one (as I have) there's very little compares with them on the market, for the money!